Lots and fee-based parking structures can cause tremendous inconvenience and headaches for patients, guests and hospital staff if not properly maintained and managed. Keeping lots maintained can be just as big a hassle. 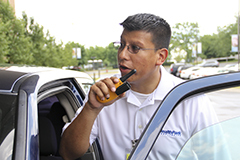 HealthPark Valet’s hospital parking management improves the parking experience, while keeping costs under control. We take pride in our responsible, proactive on-site management. You can re-focus on hospital operations rather than parking, while HealthPark takes care of parking lot staffing. HealthPark’s parking management can dramatically reduce costs compared to in-house parking management both in terms of labor and responsibility for liability and claims. We would be delighted to design a custom program for you. Contact HealthPark for a free consultation. Healthcare facilities have experienced significant cost reductions when outsourcing parking management to HealthPark.